Inmates’ families rallied at City Hall last month to oppose the governor’s proposed cut to visiting times at some prisons. Michelle Archer visits her husband, Jermaine, twice a week in Sing Sing, a maximum security correctional facility in Ossining. She lives in Suffolk County on Long Island, and on a good day, the drive is an hour and a half. On a bad day, it’s two hours. She’s been visiting him for 17 years, since she was 23 and her husband was 26. When she visits, they play games, pick out movies, talk about what he wants her to bring him to eat. They talk about their children, who are now in college: a son ,22, who is studying sustainable energy at Syracuse University and a daughter, 19, at Pace University. He’s serving a 22-years-to-life term for murder. Archer prefers to visit on weekdays because there is less of a crowd. She says she is not fond of the weekends, when facilities are crowded, creating a longer wait time and limiting the amount of time she has to spend with her husband. 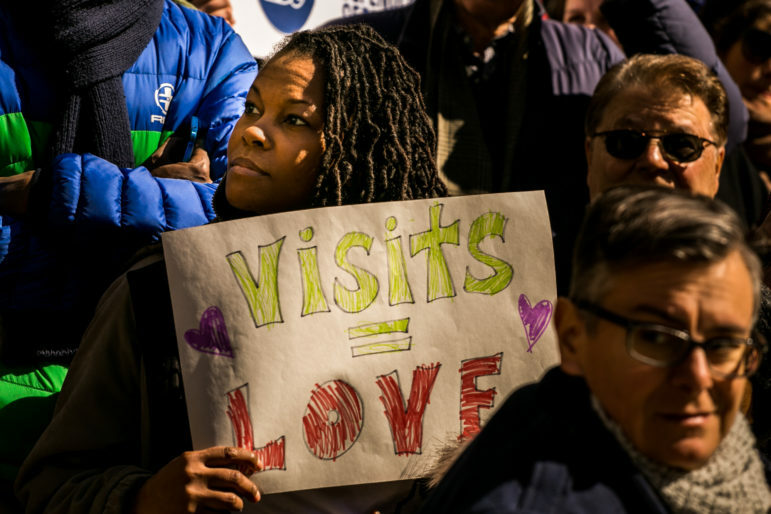 Archer’s options—and those of anyone with a loved one in New York’s maximum security prisons—could soon be limited by a proposal in the state’s executive budget that reducing visitations from seven days to three. “There’s times when I can sense where he really wants to see me,” Archer says, concerned. The budget plan, she and others believe, will separate prisoners from their support networks. Leah Gitter, 60, is also upset about the plan. She visits her godson, Robert Peńa, at Elmira, a maximum security prison. She says she is his only visitor. Peńa has bipolar disorder, Gitter says, which makes it especially difficult. “I’m his lifeline, that’s what he says,” Gitter says. She says their visits keep him anchored to society outside of prison. “You get back a sense of normalcy,” Gitter says. New York State’s Executive Budget, released on January 17, contains a proposal to reduce visitation days at the state’s maximum security correctional facilities to Fridays, Saturdays, and Sundays. The plan would also decrease the cost of telephone use for family members—they currently pay around 4 cents a minute, one of the lowest rates in the country—and expand video visitation, a teleconferencing option run by private companies that is gaining popularity nationwide but has been controversial. The governor’s office has said that the visitation reduction is intended to cut costs and to align maximum-security policy with medium-security facilities. All told, it would save the state Department of Corrections and Community Supervision (DOCCS) $2.6 million by cutting 37 full-time positions. That amount represents one one-thousandth of a $3 billion departmental budget, which would increase $6 million over last year’s under Cuomo’s proposal. Critics say the dollar amount is negligible and not worth the long-term cost of recidivism rates, nor the human cost to parents, spouses and children of the incarcerated. Gitter, Archer and others were among the around 50 advocates, lawmakers and family members who gathered on the steps of City Hall on Sunday, February 26, to request the governor not reduce prison visitations. They were joined by Assemblyman David Weprin, chair of the Assembly Committee on Correction, and representatives from Legal Aid Society, The Osborne Association, NYCLU and other organizations. Restrictions on prison visitation are often done as cost-cutting measures, but Friedmann believes these are short-term savings that will lead to higher costs later on. Locking up an inmate for a year costs on average of $30,000, so a potential increase in inmate numbers would negate any savings, he says. Hsu points out that the proprietary risk assessment tools that DOCCS uses to make case plans and inform parole decisions emphasize family connection, and that recidivism has become a priority for the agency, making any reduction in visits appear hypocritical. Advocates take issue with the claim from the governor’s office that the proposed policy is intended to bring maximum-security prisons in line with medium-security prisons. The medium-security visitation policy was instituted in the 1990s in a budgetary response to overcrowding in the state prison population. But New York state correctional facilities have decreased their populations by 26 percent between 1996 and 2012, according to a study by the Sentencing Project, a D.C. nonprofit. Anthony J. Annucci, the acting commissioner of the Department of Correctional Services, addressed his department’s reasoning for cutting visits in a January budget hearing. Annucci suggested that it was jarring for prisoners who transfer from maximum- to medium-security prisons to deal with a decrease in visiting days. The solution was to limit them across the board, he argued. That rationale has raised ire from advocates, who believe that visitation should be raised across the board, not lowered. Are video visits & phone calls a substitute? The governor’s budget includes a plan to expand video visitation as an alternative to in-person visits. DOCCS currently runs a pilot program in collaboration with the Osborne Association, a nonprofit that helps inmates re-enter society, at Clinton and Albion correctional facilities. DOCCS plans to expand video visits to 14 more prisons in 2017. The service has been free for prisoners during a trial phase, but DOCCS has not confirmed that this would continue. The suggestion that video visits could replace in-person visits alarms some advocates, who cite a national trend of jails cooperating with video-visitation companies to restrict visits. Nationwide, 12 percent of the country’s 3,283 county jails have adopted video visitation, according to the Prison Policy institute. In many of these cases in-person visits are banned concurrently. One of the leading providers, Securus, required a ban on in-person visits as a prerequisite for installing their service at county jails throughout the country. The stipulation was removed in 2015 following outrage. According the Securus Technologies website, the company offers phone or video services to a few dozen county and city jails, but not to any of New York’s prisons. Prison Legal News’ Friedmann, himself formerly incarcerated, agrees, saying he supports video visitation—with caveats. “It should not be a replacement, it should be a supplement ,” Friedmann says. The quality is often low for video visitation services: It resembles a granier and more expensive version of Skype. Friedmann says that one of the reasons for the low quality is that companies in the video-visitation industry, like those in the prison phone-service industry, enter exclusive contracts with jails and prisons, giving family-members no other option with what service to use. The FCC took comments on video visitation in 2015, but the issue never progressed to a hearing. Advocates believe newly appointed FCC commissioner Ajit Pai is unlikely to move to regulate it. Friedmann says the video-visitation industry adopts a similar model to the prison phone industry, paying state prisons a high commission off what they make from family members. In 2007, the New York State legislature passed a bill that banned commissions from prison calls services. The state had previously been receiving a fee share of over 60 percent. Phone companies have argued that the fees are needed to subsidize prison services. The FCC capped prices on the prison-phone industry in 2015. Pai , then an FCC member, voted against that restriction at the time, and in a January letter the FCC indicated they would no longer be defending caps on phone-calls made in-state. Annucci, in the January 31 budget hearing, cited an increase in prison phone-calls as one of the ways he was committed to connecting prisoners with families. He said that 68 phones had been added across state facilities in 2016, and that there were 21 million completed calls for a total of 321 million minutes in the same period. Jenise Britt, 39, has issues with the pricing schemes prison phone companies use. She uses a service to call her husband, Timothy, who has been in state facilities for 10 years on robbery convictions. There used to be a surcharge of $7.95 to turn on phone service, with additional costs for every minute. The FCC limited that fee to $3 in 2016, but Britt says that the $3 surcharge is repeated for every $50 she spends, a limitation that was not in place before FCC regulations. Ronka Molson, 38, speaks with her husband, Darius Molson, 34, who is serving a 22-year-to-life term for murder, every opportunity she gets. She has memorized his schedule and says that the breaks of time that he is allowed to call her add up quickly, even at the state’s relatively low cost. She puts the maximum $50 credit into her pre-paid account, but would put more to avoid the surcharge. “They’re constantly penalizing the family of these inmates,” Britt says. While private phone companies can no longer provide a commission to the state, Britt points to other prison services that are privatized which she feels provide an unfair burden on family members. Annucci in January’s budget hearing for protective services, reiterated the importance of family connections. “I am absolutely committed to doing everything reasonably possible to maintain family ties. It’s so critical to reintegration,” Annucci said, responding to questioning by Assemblyman Weprin. Professing a commitment to family reunification, Annucci cited the state’s Family Reunion Program, which allows inmates extended private visits with family members, as well as the number of DOCCS-sponsored special events where visitation occurred. Annucci said there were 608 special events where visitation occurred in 2016 throughout the prison system’s 17 correctional facilities, including a college graduation, a performance of The Wiz at Bedford, a performance of Shakespeare’s Twelfth Night in Sing Sing, and a “celebrate your child” night, also at Sing Sing, which Annucci seemed particularly enthusiastic about. “We had a magician come in,” Annucci said of the event. “We had arts and crafts. We had made the entire place child friendly so it looked like something from Disney Land. We had a DJ,” Annucci said at the hearing. A movement has sprung up in the past two or three years, Hsu says, with the intent of showing the impact that incarceration has on the children of those in prison and how it changes their stability and sense of self-worth. Visitation figures prominently in that effort. The push to broaden visitation is focused on more than the New York state prison system. Ebony Underwood’s father has been in federal prison for 29 years, since she was about 14. William Underwood was convicted on drug charges in 1990. He was sentenced to a mandatory 20 years plus life without parole. But when asked how her life would have been different if she had been permitted seven days of visitation (as NYS maximum-security prisons currently do) she says that she’d be able to regain an asset that is often taken for granted by those not in prison: time. In FCI Fairton Correctional institution in New Jersey, where her father is, visitors are allowed four days a week, from 8:15 am to 3:15pm. Even if she arrives at 8 am, the waiting time and processing can last hours, Underwood says. When she finally sees her father, she is rushing to say all the things she wants to say before their next meeting. Even phone-calls are limited to 300 minutes a month, something she is mindful of. A new statewide coalition has formed with the intention to push Cuomo and the state legislature for rent reforms, funding for public housing and more. The plan soon to emerge from the Bronx segment of the governor’s Empire Poverty Reduction Initiative will set the stage for the most important question: Will the state apply adequate resources to addressing, rather than diagnosing, poverty?